The following is a report from Wellfleet's Chuck Cole; a report from Dr. Brian O'Malley of Provincetown is below that. Our Cape Cod... (and then some)... Bus ... disembarking!!!! @ 23rd and Constitution Ave. Noticed a LOT of Black jacketted Veterans about as soleil and I made our way down the Washington Mall for a quick tour of the Buildings of the Capitol !!! !hmmmm a little of a "vibe" , too... we headed out for a quick tourist jaunt... with flags flying!!!!! The Lincoln Memorial at a distance..those flags at the Washington monument were "roaring"... we weren't allowed to approach , Closely... with our Peace Flags flying!!!!! try this link... Sunday's Washington Post!!! it does a great job describing what we were up against!!!!... 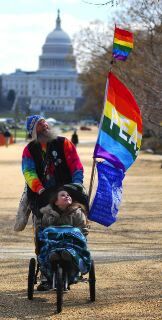 the paragraph about the taunts being aimed at peace folks... w/kids... would be US!!!! at the mouth of the "eagles' " "fish weir" !! we had been on the steps of the Lincoln Memorial... and wanted to get to the "other side"... we were behind... hmmmmm... what felt like 'enemy lines'!! !twas more than VERY uncomfortable... had to navigate a purposely created "gauntlet of snow fencing" that decreased in width to barely enough for the stroller and a GATHERED EAGLE on either side!!!!!... 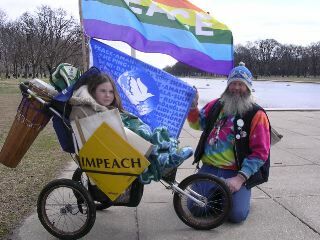 til we realized that we were at the end of the Vietnam Memorial outramp!!!! 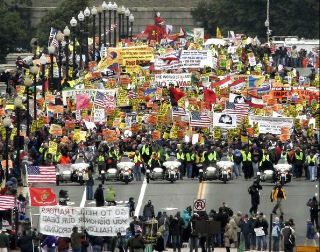 !between THAT and the encampment of Rolling Thunder/Gathered Eagles.imagine 10,000 American flags!!!!!... 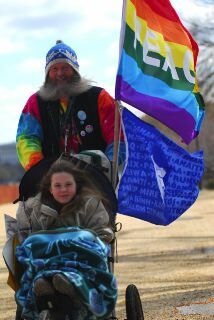 we "popped out the other side" and were on the sidewalk along Constitution Avenue... at the moment when Code Pinkers walked by..enroute to the rally site... right by... through the Gathering of Eagles... I realize now... probably quite calculatedly... on BOTH "sides"!!! as it turned out... that put us in the sights... front row center... middle of the torrent!!!! The following link makes THAT VERY clear!!! If you go to the FREE REPUBLIC SITE (down toward the bottom of this!) check out end of the first page of comments... a LONG letter all the way at the end from a Michelle Malkin!!! ... and then go to the second page of COMMENTS #51-100... and scroll down to the Graphics after #96... I guess we don't have a wrap on the "power of the INTERNET"...whewie!!!! and YIKES!!!!! 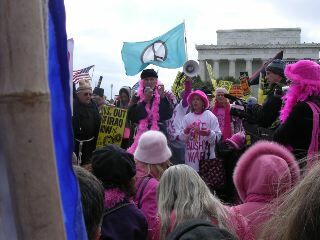 a Code Pink Pow Wow with the Priests that gathered and walked to the rally from the National cathedral where 2800 had gathered on Friday night!!! 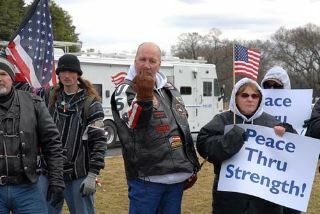 !at the start of the march across the bridge... a line of "patriots*" is out of sight but quite loud when we were there!!! 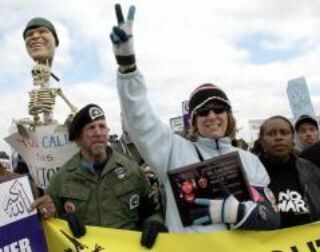 * read: Angry Pro-war Veterans!!!!! and one more video that ends with a "Peace Guy" from Paine Hollow!!!!!! 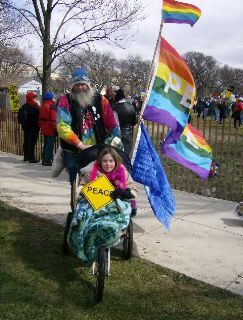 link to above video (if it doesn't work here) a little PEACE ... at the pentagon!! 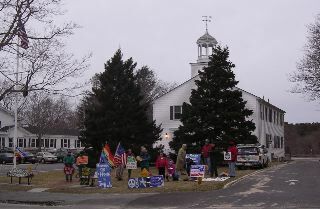 Our Wellfleet Vigil Last night 6-7pm... [3/19/2007] 15 kids and dogs and moms and dads and grandfolks... standing and drumming for peace on the 4th Anniversary of SHOCK AND AWE !!! They came dressed in MC leathers, studs, decorations, and boots. Not quite a uniform, but it had the effect. A crowd of aging white (mostly) men angry and ready to fight. 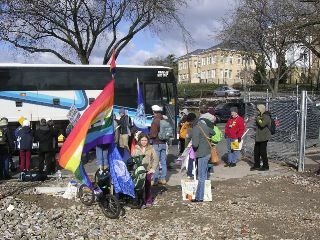 There, ostensibly, to defend the memorial wall, allegedly threatened by the marchers. 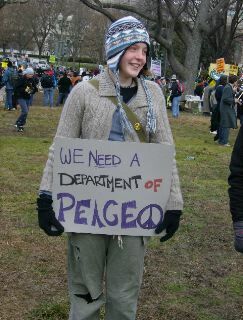 And apparently, to defend their government in general. The "Safer since 9-11" signs would seem to suggest that they support this administration. The group which seems to have organized the counter-demonstrators, The Gathering Eagles! They are angry that men were left behind in Vietnam - by the government that had, lying about the real reasons for the war, sent them there. And they are concerned about the treatment that returning veterans receive after they have served the needs of their government. But they focused their hatred on us, instead. And it was hate. Ugly, nasty, swearing verbal assaults all along. Our friends, Carlos and Melida Arredondo, marching with the traveling exhibition remembering their son Alexander, bore the brunt of some especially vicious outbursts. They bore them with dignity and composure. Angry words this time. No injuries. We need to listen, and understand. We need to find ways to the understanding that we fight a common struggle. 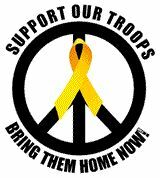 That we must together demand that we protect our troops best, by bringing them home, now, and providing them with the care they will need to try to recover, for the rest of their lives, from their physical and mental injuries. My thanks to all who made this such an experience, especially John and Jennifer.